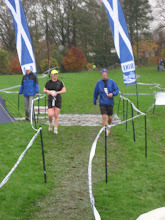 Thank you to Davie for the piccie on his blog. It is a strange picture as I have a look of concentration that I could almost pass for a runner!! The picture above was taken with my medal which I didn't take off for the next few hours and is now proudly hanging from my bookshelf. Tonight I was talking to Andrew the organiser of the Berneray 10K which I am planning as my next race. It is on 11th July. It starts at 2pm as part of the route is on the beach so needs to be at low tide. It is a mixture of terrain with machair track, tarmac, grass and beach. Berneray is a small island off North Uist which I have never visited. I have been going to South Uist where my family are from since I was a baby, often two or three times a year but yet to my shame I have never visited many of the islands close by. Normally, I am busy catching up with family or attending a three day wedding in which case a road trip is the last thing you fancy doing!!! So I have signed up to double my distance in just under 4 weeks!! What am I doing? I know the next step up the running ladder is a 10K but probably I should give myself more time and a straight forward city tarmac route. I suspect I have been associating with ultra runners too long and the mentality of taking on challenges and pushing yourself is rubbing off. I warned Andrew this evening that my previous is a 5K at 30 minutes so I might be a wee bit longer than the record holder of 34 mins. He has very kindly agreed to wait for me. Currently, Mark is deciding whether to join me. I am wondering whether to request that he runs with me to help me get to the finish but that is selfish of me as it will not be much fun for him plus do I want to finish the race all by my own effort. I don't know as just now my head is constantly on WHWR preparations so I will need to think it over next week.